The World Health Organization estimates that over a billion people – one sixth of the world’s population – are victims of tropical diseases, many of them insect-borne. Some of these diseases are collectively referred to as “NTDs,” or “Neglected Tropical Diseases.” This is because NTDs largely afflict people living in poor, undeveloped or developing countries within the terrestrial cummerbund between the Tropics of Cancer and Capricorn. Consequently, NTDs are relatively low on the list of priorities of the developed world’s advanced medical research centers. That is something a pair of researchers from institutions bearing the Baylor name hope to change. An associate professor at the Baylor College of Medicine’s National School of Tropical Medicine in Houston, Texas, Dr. Bin Zhan also heads the molecular biology unit of the Center for Vaccine Development located at Texas Children’s Hospital and the Sabin Vaccine Institute. Zhan began his career as a clinical physician, but a deep humanitarian concern for victims of filarial diseases —parasitic conditions spread primarily by mosquitoes — led him to transition to vaccine development and tropical medicine nearly two decades ago. In particular, Zhan focused on lymphatic filariasis, a debilitating condition characterized by a massive accumulation of fluid in the limbs. 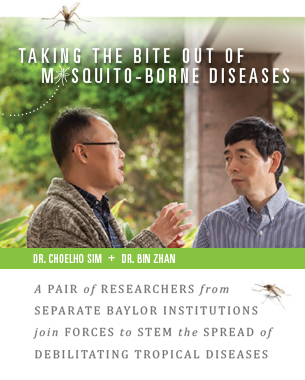 Toward that goal, Zhan has teamed with Dr. Choelho Sim, a Baylor University assistant professor of biology. Sim is a vector biologist, a scientist who is an expert on disease-bearing mosquitoes and how they spread sickness. His lab in the Baylor Sciences Building on Baylor’s Waco campus is stocked with thousands of mosquitoes bred for studies in disease transmission, including those that carry Brugia pahangi, one of several parasites that can cause filariasis. He and Zhan are employing an unusual strategy they hope will prevent the spread of the wormlike B. pahangi nematodes that infect filariasis victims. The nematodes begin their life cycles as tiny microfilariae that are released into the blood stream by female filarial worms dwelling in the host’s lymphatic vessels. In a mosquito, microfilariae in a blood meal from an infected animal or individual must escape the mosquito’s stomach — called the “midgut” — within 30 minutes after being ingested or they will be killed by the mosquito’s digestive enzymes. After escaping the midgut, they then must migrate elsewhere in the mosquito where they can mature to an advanced larval stage called “L3.” Only L3-stage larvae are infectious. If successful, the vaccine will stop the development of the microfilariae before they can get to the L3 stage. When a mosquito bites a vaccinated human, the vaccine will prevent the microfilariae from moving beyond the mosquito’s midgut in time to avoid death by enzyme. The scheme can be thought of as inoculating people who then inoculate the mosquitoes that bite them. But developing an effective vaccine depends on finding a good target molecule, one that is crucial to a microfilaria’s ability to exit the midgut and continue growing into an L3-stage larva. The two researchers will use the special capabilities of their respective institutions to find a suitable target and use it to develop the vaccine, but that is far easier said than done. “And that will be a very good target for us here in Houston to use in developing the vaccine,” Zhan adds. It is important work that has the potential for use against similar parasitic diseases, and for improving the lives of billions of people. But the researchers’ common desire to raise awareness of NTDs and promote expanded NTD research supports another significant goal of their work — prevention. “Tropical diseases are the number one cause of death in developing countries, and they are becoming more and more common even here in America and other developed nations,” warns Zhan, citing Ebola, Chagas disease, and other highly infectious illnesses now spreading beyond the tropics.